Kedarnath is a love saga directed by Abhishek Kapoor. It is Sara Ali Khan’s debut. Sara Ali Khan is the daughter of Saif Ali Khan and Amrita Singh. Sushant Singh Rajput in the movie is playing the character of a tourist guide while Sara plays the female lead opposite him. 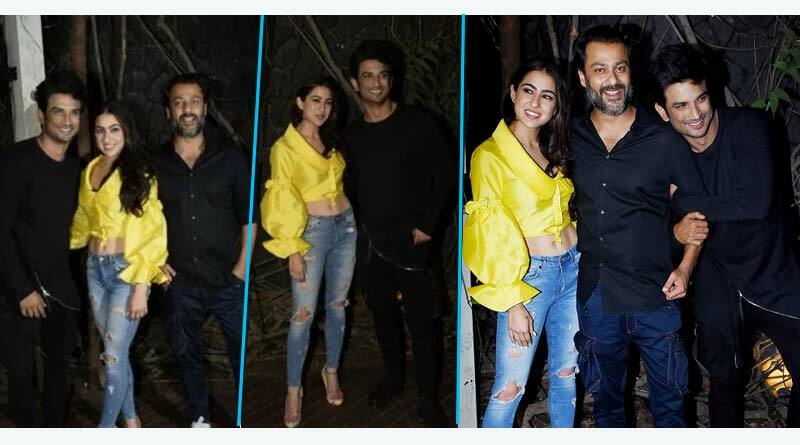 Sara Ali Khan and Sushant Singh Rajput partied last night in New Delhi to celebrate the wrap of their upcoming film Kedarnath. Sara was seen wearing a satin yellow top along with ripped blue jeans and Sushant just wore casual black. Abhishek Kapoor arrived at the party with his wife, who is pregnant with their second child…Many people were invited to the party to celebrate and we also saw Arjun Kapoor. Kedarnath went on the floor last week and trended on and off for several reasons, including some legal troubles. Some rumors say that in May, the producers of Kedarnath sued Sara for giving away her dates to Simmba while she was still under contract for the Abhishek Kapoor’s directed film. The filming of Kedarnath was also stalled for weeks after Abhishek Kapoor’s company and former co-producer KriArj Entertainment got into a legal tussle over funding. Simmba is going to be Sara’s second film, currently being shot in Hyderabad with Ranveer Singh. The film is directed by Rohit Shetty and co-produced by Karan Johar. Sara now has two back-to-back releases lined up later this year. Kedarnath hits the screens on November 30 while Simmba is expected to release in December.